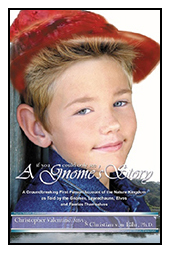 "Gnomes are gifts from the Creator and bring joy and fun back into your daily life. They awaken your inner child and show you how to live in the 'now' and to be happy." "Gnomes bring magic to your garden and orderliness to your home. Their goal is peace and harmony for you and the Earth." "This book will show you how to invite them into your garden, home, and life to form bonds of love and caring that will enrich your life and theirs." Learn how to recognize and interact with all Nature People with the guidancebtrought to you in their book. A groundbreaking First Person Account of the Nature Kingdom as Told by The Gnomes, Elves, Leprechauns, and Faeries Themselves! The first book in the world written by Nature Spirits.